I bought one of these from a flea market when I was a student. It was very old, extraordinarily hefty, and the engine would start smoking on occasion. But I had to own it because it was a design classic. I was a design student at the time, and I had my priorities sorted. I was also in no financial position to be able to afford an Alessi juicer, which probably have been my first choice of household appliances. Finally the Mixmaster’s engine died and I couldn’t use it anymore. 20 years later I only own the bowl. 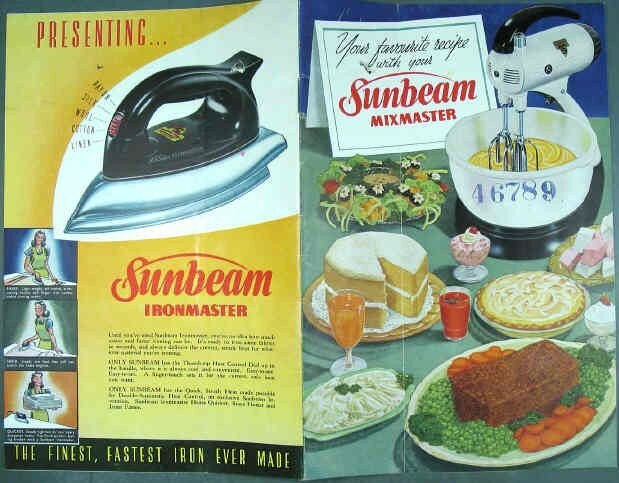 But the Sunbeam Mixmaster was never about the bowl. It was about owning a stylish household accessory that you could justify spending a month’s wage on, on the grounds that it would make you into a much better housewife. 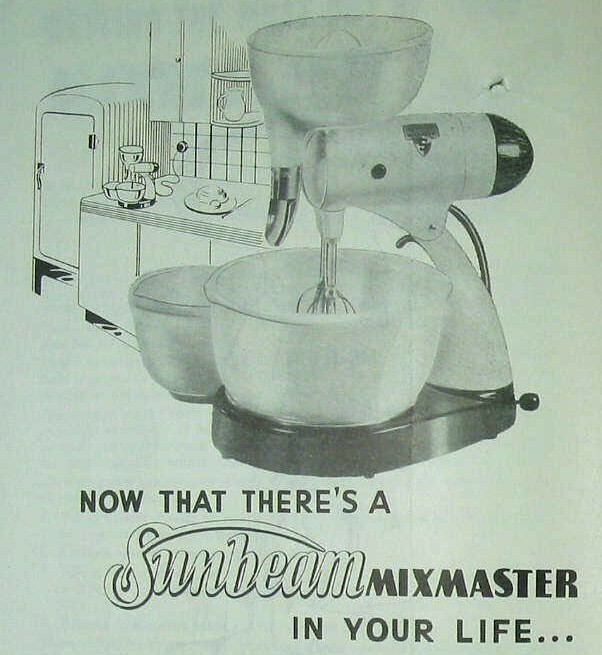 The booklet stops short of saying that by creating your own Sunbeam kitchen display, all your friends will see your Mixmaster, and might be inspired to buy one for themselves! 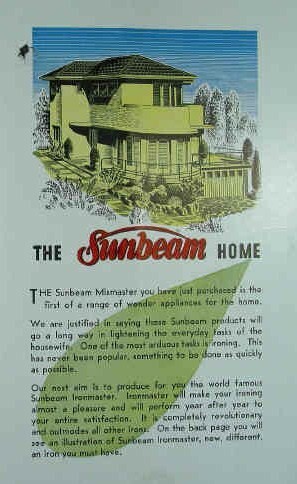 Sunbeam records that they sold 725,000 Mixmasters to Australian households between 1948 and 1958. So what sort of recipes did the booklets feature? In keeping with the idea that the Mixmaster was an indispensable kitchen item, the recipes covered all types of food imaginable. Combine sugar, water, corn syrup, in a saucepan over a low heat, stirring constantly until sugar is dissolved. Continue cooking, without stirring, to 265 degrees F, or until a little of the mixture dropped in cold water forms a hard ball. If any sugar crystals form on the side of the pan, remove them with a wet piece of cheese cloth wound around the tines of a kitchen fork. Remove the syrup from the heat and gradually pour over the egg whites, beaten stiff but not dry, in a small bowl of Mixmaster No. 8 speed, beating constantly while adding the syrup. Turn to No. 5 speed and continue beating until mixture begins to thicken, add nutmeats and vanilla and pour into a 8×8″ greased or oiled pan. When cold cut into squares. Melt marshmallows in milk in top of double boiler. Remove from heat and add vanilla. Cool. When mixture begins to thicken, fold in the cream which has been whipped in large bowl of Mixmaster at No. 8 speed. Turn into Tray of automatic refrigerator and freeze to a mush with control at coldest setting. Remove, turn into large bowl of Mixmaster which has been chilled in refrigerator and beat for 2 mins at No. 4 speed. Return to tray and finish freezing. Serves 6-8. Included because I like the name. Can’t imagine actually making it. Note the appetizing use of the word ‘congeal’ in this recipe. Dissolve lemon flavoured gelatin dessert in 1 cup of hot water or prune juice, following manufacturer’s directions and stir until dissolved. Add remaining 1/2 cup cold water or juice and set aside in a cool place to congeal. Beat egg white in small bowl of Mixmaster until stiff at No. 8 speed. Put prunes in large bowl and beat on No. 3 until very fine. Add gelatin which has been chilled until partially set and whip until light and fluffy on No. 4 speed. Then add beaten egg white and mix just enough to fold into prune mixture. Chill thoroughly. Serve with whipped cream. The two pages for mashed vegetables I didn’t bother reading. This entry was posted in 1940s, 1950s, copyight collection, New South Wales, recipe, Uncategorized and tagged cookery, food, fudge, icecream, Sunbeam Mixmaster. Bookmark the permalink.